South Philadelphia High School (SPHS), situated in the center of a concrete jungle with a district-wide budget crisis looming, is searching for greener pastures. Like many public schools, its students and teachers have little to no opportunities for hands-on learning outside of the classroom. Nearby residents have limited access to fresh produce and crave open space. But the school will soon be at the center of a neighborhood transformation as it launches plans to renovate its campus, making it a model of sustainability. 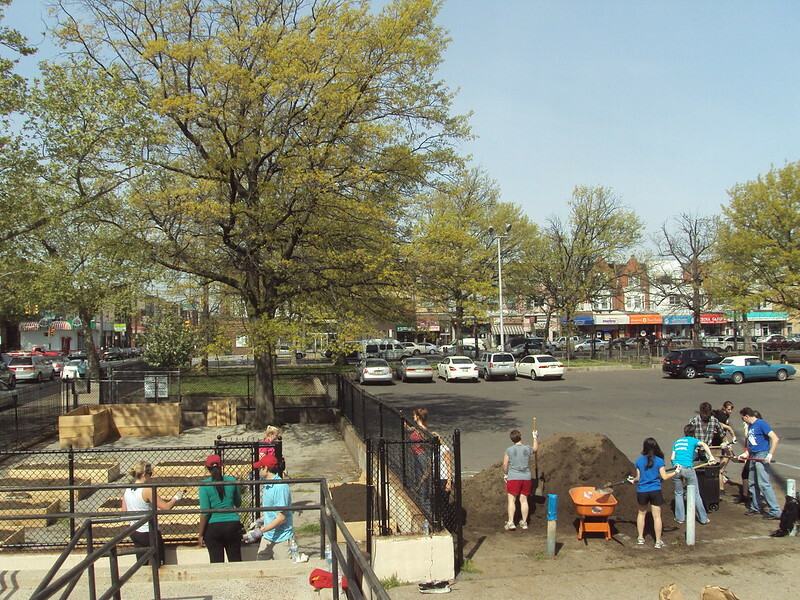 On April 9th the school will launch a sixty-day ‘Greening’ Master Plan fundraising campaign through Projexity, an international neighborhood improvement crowdfunding platform. SPHS and the Lower Moyamensing Civic Association will work closely with community representatives and the Philadelphia-based design and engineering firm Roofmeadow to develop a shared vision for the campus, which currently exists as one of the neighborhood’s largest underutilized properties. When completed, the project will feature a combination of ground level rain gardens, street trees, expanded vegetable gardens, and a rooftop farm that will improve air quality for the surrounding community and serve as a unique educational platform. A salaried Garden Coordinator will maintain the improvements and lead hands-on lessons for students and community members. “South Philly High is on the cutting edge of sustainability and innovation – it is changing the way we think about what a school should be and using technology to drive change in a totally new way,” says Kim Massare, President of the Lower Moyamensing Civic Association. The association began its collaboration in with SPHS in 2009 and has been instrumental in the greening of the school’s campus. To manage the project from end-to-end and to help raise funds and other support from the community and beyond, the school is working with Projexity, a new online tool that enables anyone to initiate, plan, gather support and execute neighborhood improvement projects. Projexity is the brainchild of a group of University of Pennsylvania alumni, who are excited to be a part of this project back in the City of Brotherly Love. The fundraising campaign will run from April 9 – June 8. If you'd like to help, you can find more information and make a tax-deductible donation. The Point Breeze Community Development Coalition and South Philadelphia H.O.M.E.S. are presenting Peace In The Park on Saturday, August 11th, 2012 from noon to 6pm at Chew Rec Center and Playground. Come join in the fun! More details are below. Our neighboring civic group, Lower Moyamensing Civic Association, is holding a flea market at South Philadelphia High School on May 19th, 2012. If you're interested in reserving a table, there is a discount that runs until April 21st. More information can be found on their website.